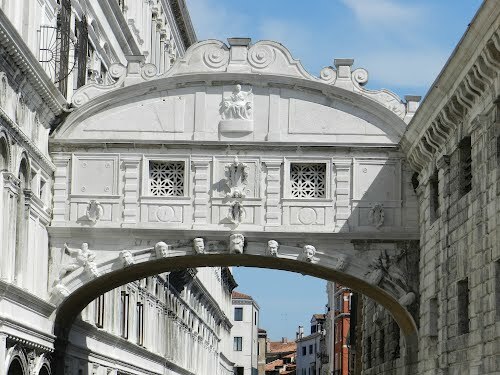 The covered bridge that lead form the Doge’s Palace to the Prisons has a somber fame. Some people think (and unfortunately write in several books on Venice) that it was named after the laments of those who were going to be executed. This can’t be true, since there are no records about it. Some others think that the name was given by the english poet Lord Byron in the 19th century, when he visited Venice. This is also inexact. It is true that Lord Byron quoted the famous Bridge in his poem Childe Harold’s Pilgrimage (1812-18) but the name existed before. Giacomo Casanova in his memories mentions the bridge twice; the second time he says that he passed ‘the bridge called of the sighs’ (in the original french version: le pont qu’on nomme des soupirs) without adding any other information about it. We might enjoy to invent new stories, but facts are something else.